Ohlson, complete form, fill, seal line with 14 head, combination weigh scale system, rated from 5 to 80 weighs per minute with number of bags – depending on materials and application. All stainless steel construction. Line consists of Ohlson 14 head rotary combination weigh scale system with strain gauge load cells, weight capacity range: 10 to 3000 grams and accuracy of ± 1 gram. (14) 11½" long stainless steel vibratory product feed conveyors to (14) 6" long x 4¾" wide x 8" deep stainless steel weigh buckets, to (14) 6" long x 4¾" wide x 6" deep stainless steel feed buckets with dual discharge chutes. Ohlson Model VFFX-539, stainless steel, continous motion, vertical form, fill, seal machine. Bag size range: 3" to 9" in Width; 2" to 11" in length. Has dual side film positioning belts, servo drive motor, film detection, tracking and registration with 10" wide seal jaws and 11" long lap seal. Maximum film roll: 15" OD x 19.5" Wide. Come with product bucket elevator with 27" long x 9" wide vibratory product feed conveyor, 31½" long x 31½" wide x 19" deep product hopper and 15" long x 4½" wide x 2½" deep plastic buckets. 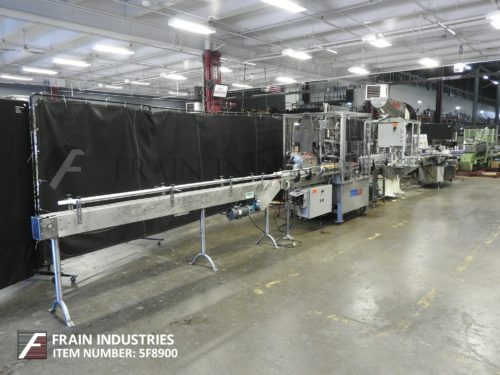 60" long incline cleated discharge conveyor with 10" wide white flexlink belt and 1" high lugs set on 9" centers to 46" OD disc accumulator. 80" long x 80" wide x 83" high and stainless steel platform with access stairs and 42" high safety guard rails.